When I first started this blog, one of my intentions was to write about some of the lore and history of Oregon. Clearly I’ve moved in a very different direction, but I’ve decided to try to make a return to my original aim. And what better place to start than with sasquatch (vulgarly known as “bigfoot”)? These are creatures who reportedly walk upright, are nine feet tall and covered with hair. The name of the creature is derived from sésquac, a Salish Indian word meaning “wild man”. There are many Native American stories about tall, hairy humanoid creatures. Sasquatch is an interesting example of a Native American belief being adopted by whites. There have been 76 reported sasquatch sightings in Lane County where I live, more than in any other county. (I’m not sure whether I should feel proud of this.) In recent years there have been sasquatch sightings in places such as Florida. At the risk of sounding provincial, I must say that I resent this. Sasquatch is a creature of the Pacific Norhtwest. It seems to me that people from other parts of the country are trying to horn in on our fun. Williams spent a good deal of time talking about a pseudonymous witness she called Mike, a “redneck” bulldozer driver from Florida, who claims to have developed close ties to a sasquatch he calls Enoch. Williams’ relationship with Mike appears to have had a profound, almost life-altering impact on her. “I felt like somebody had handed me the Holy Grail of sasquatch research,” she said of hearing Mike’s story. Williams attested that Mike was an “incredibly credible” witness whose stories were “detailed” and “intense” and never once changed despite several retellings. If it’s that the devil is in the details, and so is the believability of any good yarn. And, as related by Williams, Mike shared some lovely, offbeat and wonderfully colloquial observations about “skunk apes,” which is what he calls sasquatch. Williams’ bigfoot presentation, over time, took on a distinct utopian vibe, one of rosy romantic primitivism. The underlying message of her story was that the bigfoot — community oriented, nonmaterialistic, free of artifice and, overall, purely pure as nature itself — lives a simpler, less encumbered and more peaceful way of life than human beings. In fact, it is actually us, with our alienating cities and glitzy consumer goods and fear of boredom and, as Williams put it, our constructed selves that “change on a daily basis with fads,” who must learn from the skunk apes. “We’re so far removed from what we were,” Williams said. Yuck. This is New Age mush. This just ruins it. When I was growing up, sasquatch were terrifying creatures. 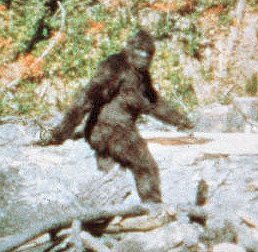 I would read newspaper stories about people who claimed that sasquatch threw rocks at them and tried to abduct them. I remember when I was about twelve years old, I saw a doucmentary about sasquatch in a movie theatre. It scared the bejesus out of me. (I suspect that if I saw it now, I would just laugh at it. One can never recapture the innocence of childhood.) Now, they’re just overgrown, hirsute hippies. Boring. I think this is another example of the Disneyfication of American culture. Everything has to be made to seem as cute as a litter of puppies. Well, I won’t have it. I want my scary sasquatch back! This entry was posted on November 12, 2010 at 8:07 am and is filed under Eugene, Oregon, Popular Culture. You can follow any responses to this entry through the RSS 2.0 feed. You can leave a response, or trackback from your own site.